A recent study by CORE Diagnostics, indicates that, of the identifiable genomic alterations associated with Adenocarcinoma, the leading form of Non-Small Cell Lung Cancers (NSCLC), mutations in Anaplastic Lymphoma Kinase is as common among lung cancer patients in India as reported in other Asian populations. This is critical in light of the fact that genetic abnormalities related to the spread and regeneration of NSCLC cells can now be targeted by specific molecules called Tyrosine Kinase Inhibitors (TKIs). These TKIs act as suppressors to the cancer related genes and successfully cause the tumor to regress. According to 2015 WHO data, cancer caused 8.8 million deaths that year of which lung cancer, accounted for 1.69 million deaths. Tobacco use is the single largest risk factor synonymous with 22 per cent of those cancer deaths. However, a significant proportion of patients diagnosed with adenocarcinoma, a cancer expressing first in the outer portion of the lungs, have been non-smokers. Environmental pollutants such as asbestos, arsenic, chromates or even breathing disorders such as tuberculosis and fibrosis have been correlated with adenocarcinoma prevalence. The Indian Journal of Medical Research reported in 2015, that 9.3 per cent of all cancer patients succumb to lung cancer. 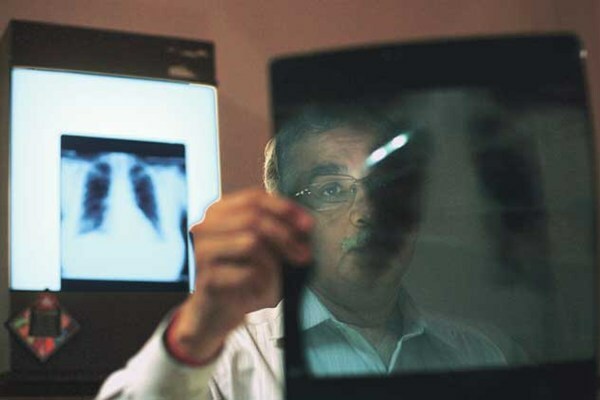 Further, 6.9 per cent of all newly diagnosed cancer cases are attributed to lung cancer. The prognosis or five-year survival rate for lung cancer in India is lower than that in Japan (32 per cent ) or China (>12 per cent ). The clinical parameters from this study are comprised of data from 512 patients of which only 42 displayed ALK mutations between the age group of 24 years and 81 years, the mean being 57 years. The number of male subjects (approximately 57 per cent) was slightly higher than the number of female subjects. About 28.5 per cent of cases advanced to Stage IV lung cancer where the disease had metastasized (spread to other sites from the origin). “Data on the clinical and pathological features and the treatment options available for ALK-rearranged adenocarcinomas have scarcely been studied across South Asia. This study recognizes an important trend in the treatment of lung adenocarcinoma via genotyping of the tissue from the tumor. It is recognized that mutations in EGFR, KRAS and ALK are mutually exclusive among adenocarcinoma subjects and the identification of a biomarker helps direct targeted therapy accordingly. This type of treatment avoids administration of chemotherapy or radiation where the body sometimes cannot differentiate between cancerous and non-cancerous cells. The frequency of ALK mutations we found in our study correlates with the known frequency of ALK mutations in theAsian population. Hence, it is of utmost importance to test all non-small cell lung cancers for genetic mutations ”, says Dr Shivani Sharma, Pathologist, CORE Diagnostics.